Today's a great day to launch an occasional feature called "From the Notepad", which will include comments from readers, updates on previous entries, random things that have been rolling around in my head1, and a piece of notepad ephemera. Today's notepad sheet (pictured at right) doubles as a minor mystery. It's from Dietz's Lawn and Garden Store, located one mile north of Stony Brook at R.D. 7 in York, Pennsylvania. 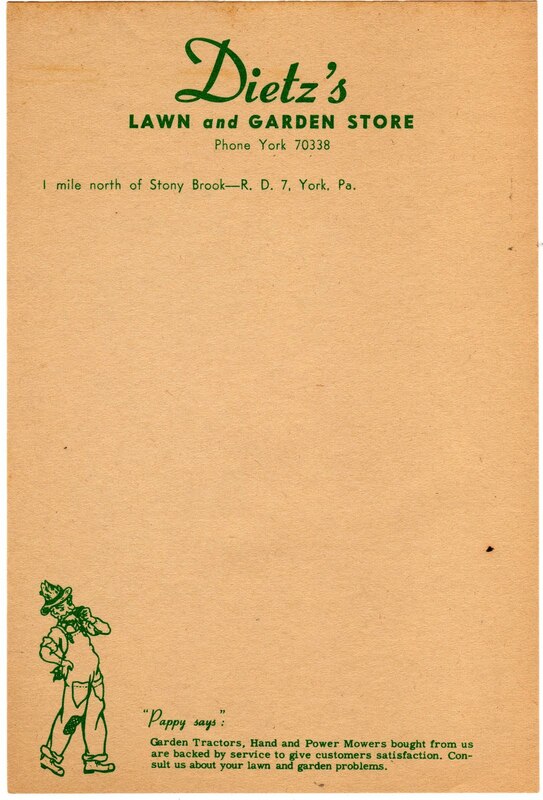 At the bottom of the sheet is this "Pappy says" tip: "Garden Tractors, Hand and Power Mowers bought from us are backed by service to give customers satisfaction. Consult us about your lawn and garden problems." I haven't been able to find anything relating to the existence or history of Dietz's, so I might need to turn to my wonderful wife and her "Ask Joan" column. And, of course, if you have any thoughts or insights on this slip of paper, include them in the comments section. Bacling, who describes himself as a "husband, father, pastor, fire and life safety educator" has indeed put together a fascinating blog, using a relative's old journals as a hook to write about the past and present. 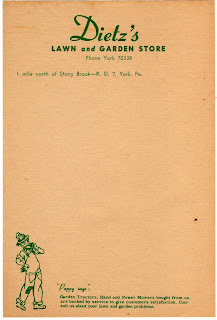 On Thursday, March 31, 1927 Bonnie Elmore wrote: Rain-Cold. Pay Day. Arose at 6:00. Made a fire. Dumped ashes. Left home at 7:45. My eyes hurt very badly. Walked down street at noon. Norman took meat to Scout leaders at 6:30 p.m. to demonstrate campfire cooking. I got haircut also bottle of Wampoles. Shaved after supper. Chilly. We went to bed about 11:00. If you like that excerpt, you'll definitely want to check out more at Bacling's blog. 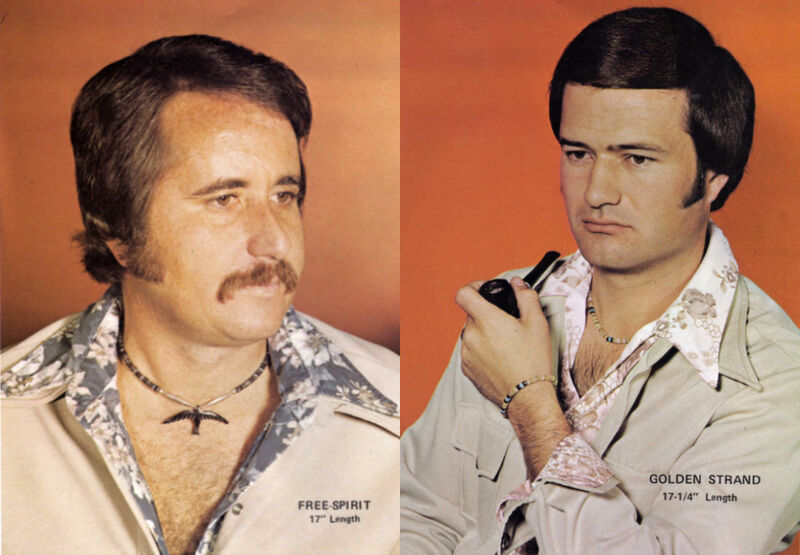 MUTUAL ADMIRATION SOCIETY: If you've been working hard and perhaps employing a therapist to help block out the images presented in last week's entry on "He-She Jewelry", you might want to move on to the next item. I mentioned the "cosmic, karmic connection going on here across two continents", with regard to bloggers in England and the United States writing about the same silly piece of ephemera and using the exact same two images. In response, Chris P. Bohn, the British author of the original "He-She Jewelry" post, has dubbed me his "new favourite writer in the whole wide world" on his current blog, dotsey.com.2 Bohn also describes me as having "exquisite taste," which might cause my wife to gag on her Diet Pepsi. Anyway, I will continue our intercontinental lovefest by reminding everyone that Bohn's book, "A Modicum of Daftitude" is still available and now sports the ridiculously low price of $7.55. Buy copies today for all your nephews and neighbors! 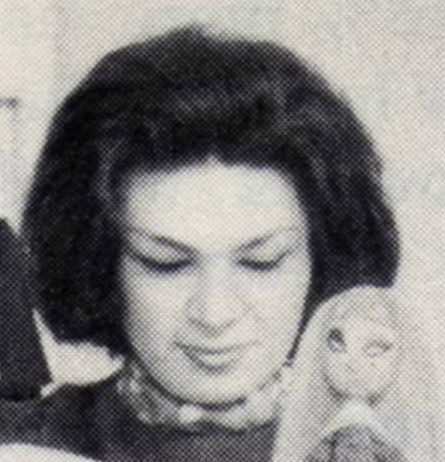 LADA DRASKOVIC UPDATE: Toward the end of the March 24 entry on "Doll fads of 1960", I mentioned the "sweetniks" dolls created by Yugoslavia's Lada Draskovic (pictured at right), and challenged readers to help find more information about her. There haven't been any volunteers yet, so here's what I have discovered. Let me set out what I know. The family Draskovic was resident in Kotor Bokarska until World War II. I believe that the father may have been executed by Tito's Communist forces in 1944 and that this was reported in the local press. The mother moved to Dubrovnik where she was living in mid 1947 when I visited her there whilst still in the Army and attached to The British Embassy in Belgrade. I also visited and photographed Stojan's grave and was told he had been killed in action against the Germans in 1944. As to Dejan I think he was possibly at Bologna University rather than, say Padova. He was with a group of Italian Partizans north of Assisi and, after the liberation, fell gravely ill in Gubbio during October 1944. I took his sister [Note from Chris: That would be Lada] over to get him from there and brought him back to Florence, where he recovered. That was a hair-raising journey by jeep with no windscreen in bad weather. At the time I was part of a small unit waiting to go into Bologna, but we never achieved it. Lada was working as a receptionist at The Excelsior Hotel in Florence from after the liberation in 1944 until late 1947, when she may have married an Italian businessman in the hardware business. At that time the Excelsior was an Officers Rest Hotel run by the US Army. Unfortunately all their staff records were lost in the postwar flood disaster. The then-manager, "Boris", was transferred to the Danieli in Venice, but has died so there are no leads there. Later in 2005, Chavasse mentions in a post that he has "succeeded in tracing Lada Draskovic", but doesn't specify what that means or give any further information. The best hope at this point might be tracking down Chavasse and seeing if he has anything further that he can divulge on what became of Draskovic and her sweetniks of 1960. TWEETS AND TWITTER: Did you know that you can follow @Papergreat on Twitter? Among other things, you'll get a tweet every time a new post goes up. And I might have an ephemera giveaway through that account sometime down the road, too, so it's a great time to get on board. I'm a bit of a Twitter addict myself. I follow an eclectic group that includes Phillies beat writers, national news organizations, booksellers, friends, Penn State football sources, meteorologists, authors and a couple of celebrities3. One thing that has surprised me about Twitter is how its 140-character limit hasn't stopped people from finding ways to deliver eloquent commentaries and rants. Comic stores are increasingly becoming pop culture stores & this is a good thing. All of it - comics, vinyl, anime, action figures, games, Bettie Page, old forgotten wonderful TV shows - go together. They represent the totality of something I think matters: the American imagination. Comic stores are imagination shops. In an increasingly digital world, your neighborhood #comicsmarket gives you the chance to own lasting daydreams, not disposable "content." I couldn't agree more, by the way. 1. It's a scary place up there. I advise you to take a flashlight and a baseball bat. 2. I am considering reworking the banner graphic on Papergreat to include that quote. 3. Oddly, most of the celebrities I follow have a Star Trek connection. William Shatner and Leonard Nimoy -- both 80! -- and Wil Wheaton all have great Twitter personalities.